1. The idea for the book came from situations I observed back in my school days. I couldn’t understand why some girls let their “friends” treat them the way they did. Hadley isn’t based on me, but rather on a lot of things I witnessed that made an impression on me. ​2. The Pilar character is a mix of both a mean girl and a victim of a mean girl. In ,Competing with the Star, you’ll learn more about Pilar and why she acts the way she does. 3. The first time I saw the show, “Girl Meets World,” I thought that Lucas (Peyton Meyer) looked exactly like how I pictured Nick Jenkins in my mind. 4. I went to Grand Haven almost every summer as a kid and teen and made several research trips, too. There’s nothing like walking the pier imagining the characters with you. I have tons of pictures—I even have the picture of the alley where Asia and Hadley see their rock star crush, Jack Brogger. 5. There’s a scene where Nick walks Hadley and her friends home early from a party even though it means he has to leave himself. It’s based on something that happened when I was in high school and a guy left a football game early to walk me and my friend to her brother’s car which was parked far away. I thought it was the sweetest thing and never forgot that. I started writing the book and was thinking of all the times I had witnessed girls going along with being treated badly by friends. I never understood those friendships where one minute someone is your best friend and the next they’re making mean comments about you in front of other people. Then I decided to take someone (Hadley) who was desperate to find somewhere she belonged and throw in the added allure of the new friend being a former TV star(Simone) so that Hadley would have more incentive to want to be liked by this famous person. I wanted to see if someone so eager to fit in would be able to find her own voice and become comfortable enough in her own skin to see that she didn’t need to conform to be liked. I really liked the whole idea of a person finding their tribe and where they felt most comfortable versus what society tells you that you should want. I also wanted to show the real side of celebrity and the fake Photoshopping, etc. that goes into it to show another side of Simone. Did you ever deal with any of the situations Hadley finds herself in? Well, I never found myself in a situation where my best friend moved away and I didn’t know anyone else in the class. The closest I came to that was when I was about to start high school and I got my schedule. I had gone to a small, private school and I didn’t have one person from that school in my homeroom or my first hour. So I started school that first day knowing I wouldn’t see a single person I knew for a good two hours. I was terrified, but it ended up being the best thing because it forced me out of my comfort zone and to meet new people. I ended up making all new friends and I’m in touch with almost all of them today. Sometimes you need that push. When did you begin writing the book? I began writing it in 2002. It went through a lot of changes over the years and there were several years when it sat while I was pursuing other things (journalism and grad school) and other books. The things that stayed the same are the friendships between Hadley and Charlotte and the bond between Hadley and her Aunt Faith. Some of the things added in were the Asia character’s impact on Hadley, the love triangle with Reagan, Nick, and Hadley and the Nick character period!—the first few drafts had no Nick, but rather the focus was on Simone’s career. The original book had more scenes with Hadley dealing with Brittany Buchanan and her mean girl attitude. I liked the idea of bringing in a guy who sees and likes Hadley for who she really is and who is someone she can feel comfortable with…and then I threw a little wrench into it. Did you do any research for the book? I visited Grand Haven and Saugatuck several times. I had spent a lot of time there growing up, so I had my memories, but I needed to go back and map things out and get a better feel for the environment. I saw something on this last trip there that inspired a cute scene that will show up down the road in another book in the series…maybe book three! What do you hope readers will take away from the books? I wrote the books because I think it’s easy to feel alone and worry that you won’t be accepted if you don’t try to fit in with the crowd. The book shows how we all go through those moments—even the former TV star, Simone, shows how insecure she is—maybe even more so than Hadley. I grew up during the time of the supermodels and I didn’t realize how photoshopped and fake those images were and now, with social media sites, it’s only gotten worse. Instead of seeing Cindy Crawford airbrushed, teens are now seeing the girl who sits next to them in algebra using filters to take pictures and trying to gain followers on their Instagram and Facebook page and using their Youtube channel for insta-fame. The teen years are already hard enough without adding all these other elements into it. 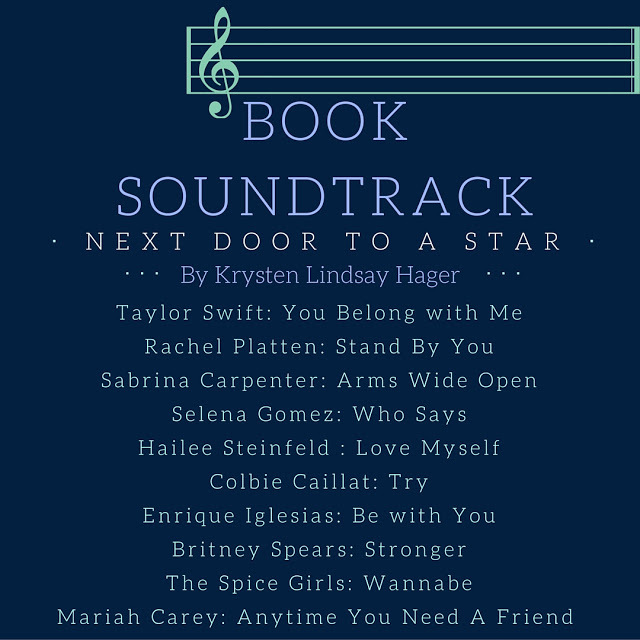 Next Door to a Star shows how we all worry about being accepted and have our moments of insecurity and the book also has moments of humor to keep you laughing as well.